News 5/28/2015: We've moved! Please see our contact us page for current contact details. Custom crafted for those who seek and demand exclusivity. Our special service is offered on a appointment basis only. Be it a style from our archives of past and current production, or a new concept that you would like to have developed. We will craft according to your desired requirements of leather and fabric. Our bespoke capabilities have given way to a wide range of products; A 6 piece set of custom fitted luggage for a prominent German automobile company, to a custom Presentation Case for a world leading Hotel and Real Estate firm. 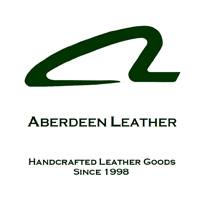 Aberdeen Leather looks forward to discussing your exclusive needs. Our efforts are dedicated to offering our customers uncompromised quality of product. In crafting or creating a product, it starts with quality materials. This is true in building a home, a custom suit or a fine leather bag. We strive to offer our customers the highest quality of make. 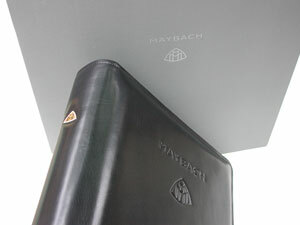 This is achieved by first selecting the finest full grain leathers. Craftsmen carefully apply their years of skill, as they craft each item as a form of art. Fine consistent stitch detail is found throughout every item. Our bags offer leather piped seams. This not only better defines the finish, but also reinforces stress points. Our interiors are fully lined in waterproof nylon. This makes easy work for maintaining the interior should any cleaning be necessary, but also allows for your clothing to arrive at your destination smelling fresh and clean as when you packed at home. Leather cord handles and adjustable shoulder straps are found on most travel bags for ease of handling. Our personal leather goods feature turned edge finishing with 10 stitch per inch. You’ll find French style cradle construction, as this allows the wallets to fold neatly when full. Hand creasing of folded edges lends accent and reflect the careful attention to quality of make. Be it a travel bag, a wallet or other finely crafted item, you can be assured that each is produced to standards of a bye gone era. With over 35 years in the leather goods industry, Aberdeen's designs are proven to last. We know where the best leather and hardware comes from. We work with the best manufactures that still rely on old world techniques. We also know what details you are looking for and incorporate them into all of our designs. If you have questios feel free to contact us. Aberdeen Leathers feature pure vegetable tanned cowhide leathers. Free of modern day chemicals, our leathers are tanned naturally with tannins and oils found in numerous trees and other vegetation. Only the finest grading selection of hides are considered for Vegetable tanning, as this method is time consuming and costly compared to that of modern day chemical or chrome tanning. Due to the lack of chemicals used in this process, Vegetable tanning is considered environmentally friendly. This 100% vegetable tanned leather is placed in large drums and tumbled to achieve a softer “milled” finish in hand. Coloring is struck through with aniline dyes and then enhanced with light natural waxes. This allows for the rich full grain to be maintained. No harsh pigments or paint are used that might alter the full grain. Our Milano leather will continue to breath, allowing it to age gracefully and gain an even more beautiful patina. For the leather purist who demands a smooth vegetable tanned leather of the utmost premium selection. In choosing Harness leather, you’ll be selecting a leather that reflects all the natural beauty of full grain character. This leather is most commonly known in the making of English riding saddles. After the completion of the tanning process, the hides are then “hot stuffed” with additional natural oils and fat liquors. 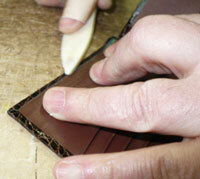 This treatment will enhance and naturally give the leather a rich patina over time. Natural aniline dyes are used in the coloring of this leather.